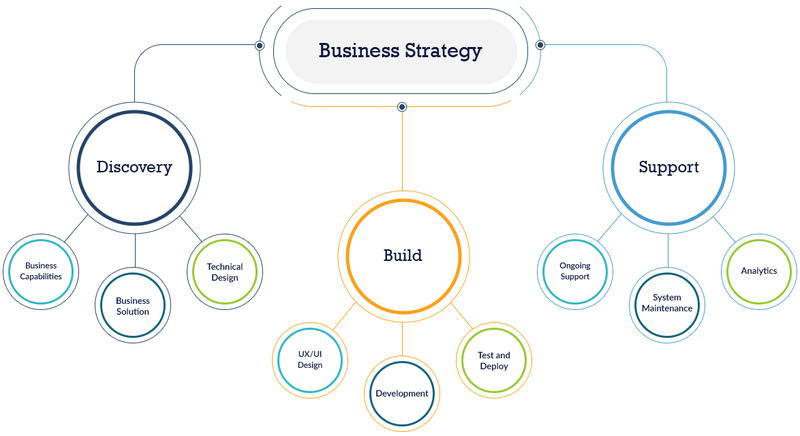 We have developed a proven framework, with strategy as a guiding principle, which we follow through from the beginning to the end of engagements we embrace. Our process framework results in high-impact ROI that allows our clients to drive real measurable growth and continue to reinvest in their technology infrastructure. At Curotec, we understand the needs and aspirations of companies ranging from startup to enterprise in regard to their web and application development initiatives. Not every project is the same, and they cannot be treated like they are. We have a refined hands-on approach with our clients that starts with our initial planning and discovery process. Through this process, we begin to learn the ins and outs of your business model and industry, along with the scope and requirements to be delivered for your project. We follow Agile methodology that allows us to deliver a product that is adaptive to changes in the business climate, as opposed to predictive of what the climate may be prior to having any form of true measurement. Our focus is on website or product iteration, early delivery, rapid response to change, and, above all, clear communication. KISS, most people have heard it before, and we are not talking about the band, either. Keeping it simple is a design principle originated in the ’60s that simply states most systems work better if they have minimal complexity. We apply this principle to all of our projects, both from a user experience standpoint and from an engineering standpoint. Because we believe a site with ample information and functionality need not sacrifice elegance! What good is an app or website if it cannot be accessed? Users are lazy and will quickly abandon all hope in your product if they get hung up on a simple step early in their experience. Ensuring your end product is usable and intuitive on all major devices and versions is critical to the long-term success of your project. The iteration process is essential to measure the results of your product, be they positive or negative. And we glean key information from each cycle of this process. However, for this knowledge to have any tangible value, it must be applied to future iterations through an adaption or evolution in your product or business objective. The more this is done, the more honed and refined your product becomes.